Item # 312473 Stash Points: 13,495 (?) This is the number of points you get in The Zumiez Stash for purchasing this item. Stash points are redeemable for exclusive rewards only available to Zumiez Stash members. To redeem your points check out the rewards catalog on thestash.zumiez.com. From ditch slap sessions to sidewalk slashing, the Landyachtz Dinghy White Tiger 28.5" Cruiser Complete is an ideal option. A squared off, elongated and steep pitched tail offers big ollies, while the slight "W" concave maintains excellent grip, foot-to-board, even with this set-up's overall more mild concave. Large wheel wells provide room for 63mm, 78a Fatty Hawgs wheels to maximize roll speed and grip around gnarly corners and minimize hang ups on pebbles and other debris. Finished off with Polar Bear 105mm street trucks for stability on hill bombs, stalls and grinds, this set- up is ready to rip from the street to the skate park. 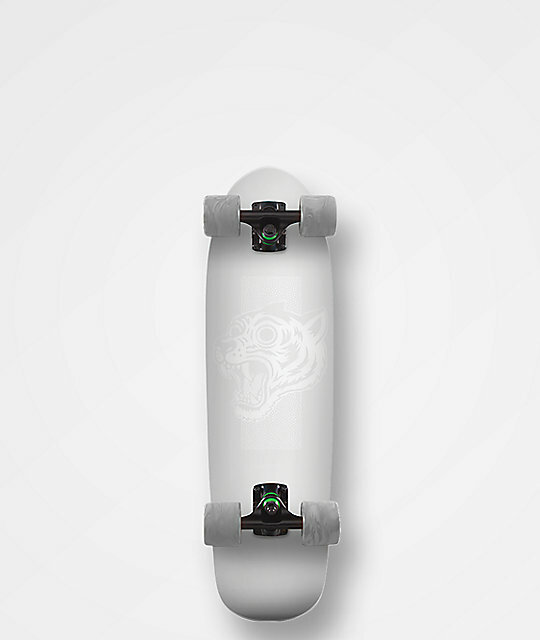 Dinghy White Tiger 28.5" Cruiser Complete from Landyachtz. 7-ply maple construction with wheel wells to prevent wheel bite. Shaped deck with flat square tail and short oblong nose. Fatty Hawgs 63mm 78a wheels. Polar Bear 105mm trucks with 1/4" rubber riser pads.